Pressure from hungry walkers has forced a u-turn on plans to stop serving food at one of England’s best loved youth hostels. 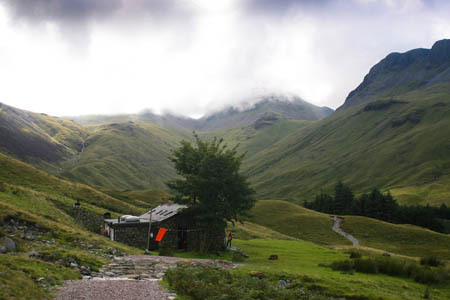 YHA earlier announced plans to stop offering catering at the isolated former shepherd’s bothy at Black Sail, in the shadow of Great Gable at the head of Ennerdale. The hostel is only accessible by walkers, cyclists and an odd four-wheel drive vehicle. There was an outcry when the association said it would stop serving meals and turn the remote site into a self-catering only setup. Walkers complained the traditional hot meals served at the hostel were an integral part of the enjoyment of the place. YHA’s problem was that a scheme to return Ennerdale to a more wilderness environment meant the pressure was on to minimise vehicle movements to the building. The whole valley is slowly being allowed to revert to its natural state, with pine plantations being replaced by native species and the forest track to the valley head being allowed to deteriorate. The Wild Ennerdale scheme was devised by the major landowners in the valley, The Forestry Commission, National Trust and United Utilities. So the hostel’s administrators had to look at pulling its hot meals service. An appeal was also started to raise £250,000 to make Black Sail self sufficient and more ecologically sound, and to improve the main Ennerdale hostel at the valley’s roadhead. 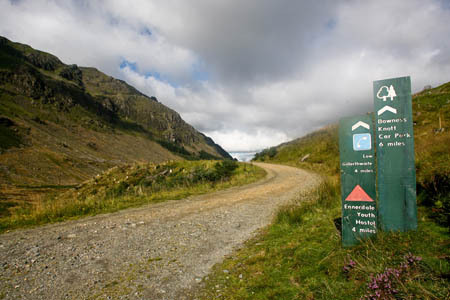 The main hostel provides most of the supplies for Black Sail, using Land Rovers along the forest track. John Connelly, YHA’s regional general manager for the North, explains the organisation’s change of heart: “YHA is a firm supporter of Wild Ennerdale and we were always very mindful of the need to reduce the environmental impact of Black Sail to support the project’s objectives. “We believed withdrawing catering for our guests would help reduce the number of vehicle journeys in the valley but this was a proposal that was not taken well by some of Black Sail’s many admirers. “They told us they believed the memorable meals they had enjoyed at the hostel were an integral part of the experience and this helped us reach a suitable decision. Simon Ainley, development manager for the North, added: “While we still need to take a Land Rover to the hostel to transport laundry, refuse, gas bottles and cleaning products, through proposed changes to energy use and storage capacity on site, we can also provide catering while keeping the number of journeys to an absolute minimum. “We have also agreed in principle, a scope of works with our partners which will see Black Sail improved and reduce its environmental impact while retaining its essence and unique character. A hydro-electric scheme will be built using money from the earlier appeal. The YHA will also explore the possibility of securing grant funding to make more eco-friendly improvements such as solar panels, sheep wool insulation and a new wood-fuelled heating system. Black Sail stands on the route of Wainwright’s Coast to Coast route and is surrounded by dramatic mountain scenery, with Pillar, Kirk Fell, Great Gable, Brandreth and Haystacks all overlooking the hut. I've never visited Black Sail but this all sounds like a fantastically good decision and has encouraged me to resolve to make a visit as soon as I can! Is there a dedicated website link at all? "Pressure from hungry walkers has forced a u-turn..." Sorry, this has got to be a joke! I hate it when associations back down due to the lazy walkers who refuse to carry their own food and water up a mountain. "YHA is a firm supporter of Wild Ennerdale and we were always very mindful of the need to reduce the environmental impact of Black Sail to support the project’s objectives." "They told us they believed the memorable meals they had enjoyed at the hostel were an integral part of the experience and this helped us reach a suitable decision." If they do withdraw catering I really do hope they intend to improve the self catering facilities available. I think not, as this will impact on the enviroment, just think of all those extra vehicles going there with new kitchen equipment and extra gas for 16 people cooking individual meals rather than the warden cooking once for 16 people. What is there now works, has done for decades. I'm sure walkers would be happy to carry out refuse. This would reduce some of the land rover journeys. I have had 2 excellent stays at Black Sail this Autumn, once on my own, on the 1st night the new management team (Steve & Claire) were there, and again with my family (wife & 2 children) at Autumn 1/2 term. Both memorable visits- fantastic spot & building, being remote meant that all staying 'got along', and the atmosphere created by Steve & Claire first class. If anyone reading about this hostel hasn't been- make sure you do- hostelling at its best!